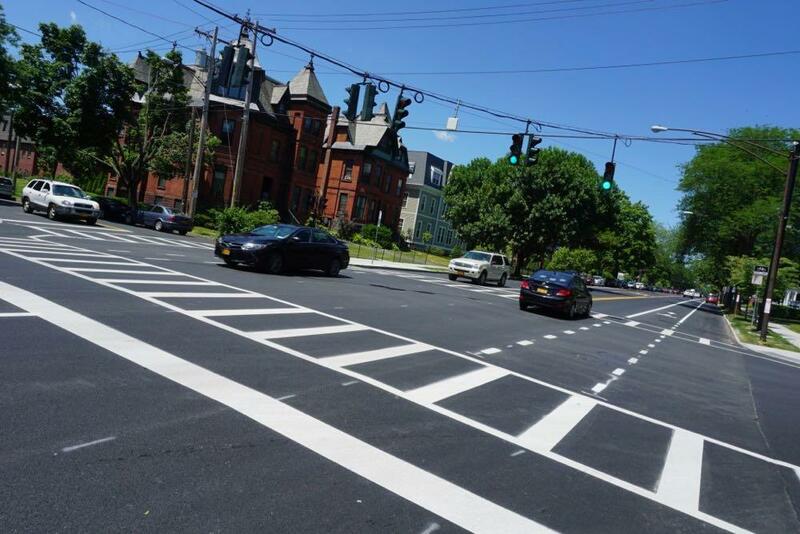 The project reformatted Madison Ave from Allen to Lark from four lanes (two vehicle lanes in each direction) to three three lanes (one vehicle lane in each direction, with a center turn lane) and bike lanes on either side. 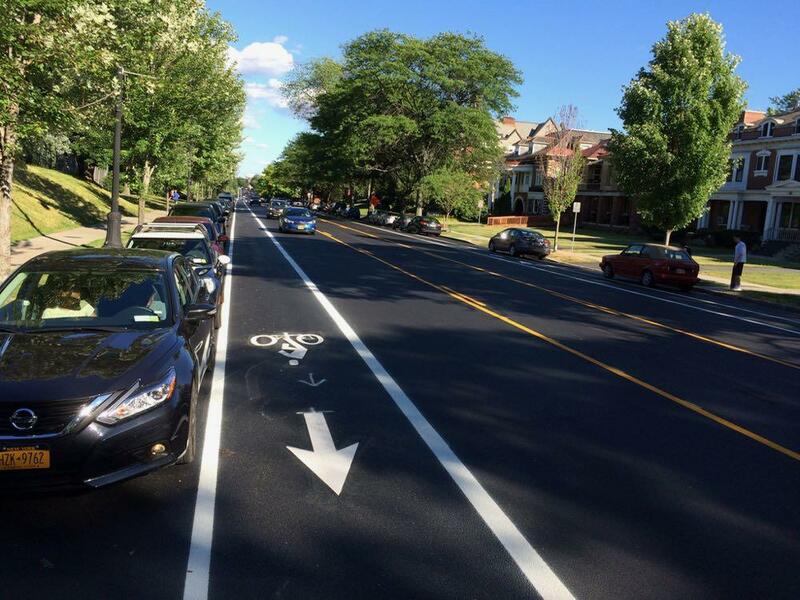 The bike lanes have gotten a lot of attention, and that's understandable. They're a significant upgrade to the city's bike infrastructure. But the Madison Ave project also involves a lot of other parts. 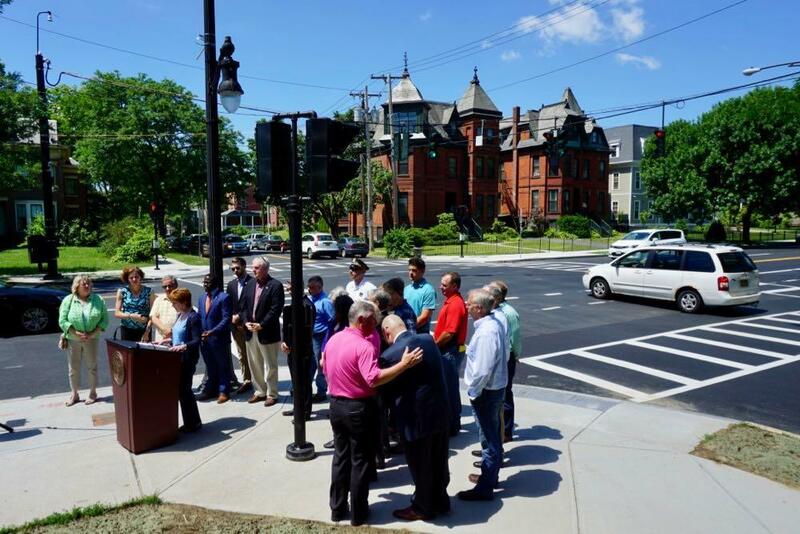 Bill Trudeau, the coordinator of traffic engineering for the city, said the project replaced or upgraded equipment at 11 intersections along the corridor. And many of those changes are intended to benefit all sorts of users of the road. Trudeau said the project added pedestrian equipment to intersections where it didn't previously exist, and upgraded what was already there. "The pedestrian push buttons, they have an audible tone for the visually impaired," Trudeau said as we stood near Madison and Lake, one of the buttons beeping in the background. "You push the button and hold the button it I'll tell you what street to cross or it'll tell you to wait. It'll tell you when you can cross. We added countdown timers that weren't there." One of the biggest parts of the Madison Ave project will probably go unnoticed by many people if it ends up working as intended: a new, modern traffic light system. Trudeau said the previous signals along the corridor -- some of which still ran on gears and motors -- operated independently of each other and weren't coordinated. The new signals can be programmed to work together. And that's very important for the long term success of this project, because the traffic modeling done during the planning process indicated that signal synchronization was key to keeping traffic flowing along Madison Ave at travel times roughly similar to before. "So we made sure to challenge the engineers that were designing it to make sure that we could fit as much traffic into the signal timing as possible on each cycle," Trudeau said. "So we're there and then we adjust for morning and evening drive times. So we've gone into a little different pattern." In addition to the signals, the project also adds left turn arrows and left turn lanes at various intersections. One of the goals of the project is to make Madison Ave work as well or better for everyone -- vehicles, bikes, pedestrians. It's part of the "complete streets" concept. But there are still people skeptical that can be true. So tracking the performance of this corridor -- crashes, travel times, and other bits like that -- will be important in understanding what sort of effect the new design is having (and where there need to be adjustments). That's especially true as the city looks at the possibility of similar projects in other spots. Sometimes ideas take a while to gain traction before they move forward. And that was definitely the case for this Madison Ave project, the roots of which stretch all the way back to 2004. The early advocate for the idea was Virginia Hammer, the president of the Pine Hills Neighborhood Association. 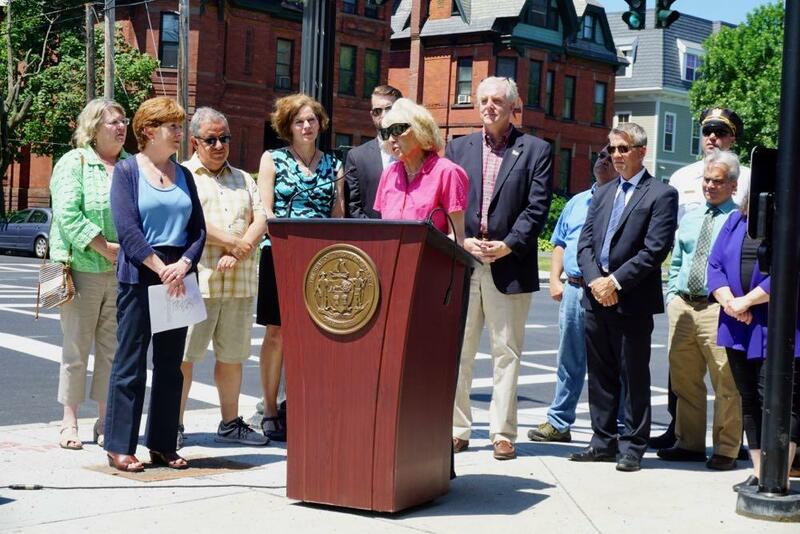 She persistently pushed for the traffic calming project over many years, keeping it on the radar, and getting Common Council members and other officials on board. Kathy Sheehan singled out Hammer's contribution on Friday. "If you have a good idea, you have to talk about it -- and people will listen," Hammer told the crowd gathered at Madison and Lake. "You can do it." That sort of persistence, to advocate over many years for an idea that you think will help your community, is admirable. But it's also a little discouraging that it took more than a decade to add some bike lanes to a street where they make a lot of sense. So we asked Kathy Sheehan about whether her administration has learned anything about moving projects ahead faster, so that the next project of this type -- whatever it might be -- doesn't take as long. "My goal is to move things from ideas to feasibility studies as quickly as possible," Sheehan said, pointing to the Albany Skyway as example of a project that's moved from conception to planning to expected implementation in just a few years. And she credited the Regional Economic Development Council process for making money available to local municipalities for the feasibility and planning studies that set the stage for projects to move forward. Another issue: The city only has so much capacity to plan and execute projects that are outside the day-to-day operations. "When I first started we were focused on Tivoli Preserve and on the Madison Ave street calming and on the rail trail connector and on the Corning Preserve project, which we had to really salvage. We almost lost 5 million dollars to do those bike trails and the improvements that we did at the Corning Preserve," the mayor said. "So it's really the internal capacity. There needs to be somebody to manage the contract. There needs to be somebody in engineering to approve [requests for proposals]. And so we've tried to focus on how do we set expectations so that people recognize that the delay isn't because we don't want to do it, but because we're going to be really realistic about what we have the capacity to complete." "So we've tried to focus on how do we set expectations so that people recognize that the delay isn't because we don't want to do it, but because we're going to be really realistic about what we have the capacity to complete." And along the way not everyone's going to agree about the direction of the project. In the case of the Madison Ave project, there were cycling advocates pushing for protected bike lanes (which didn't make it into the final plan) and skeptics worried about the impact of the project on parking and traffic (the new design eliminated about 50 parking spaces). At one of the public meetings, a person exuberantly declared the road diet "a cockamamie scheme." That back-and-forth stretched the process out, too. Sheehan said the way forward was to get everyone in the room at the same time. "We come at it from a place of respect and from a place of understanding that, you know, there are pros and cons and things that need to be balanced -- no matter what you're advocating for," she said Friday. "And so I think that that way of working together resulted in this finally getting pushed out and getting consensus around it. Is everybody happy? If I tried to make everybody happy nothing would get done. So I think that this was a process where I was able to demonstrate that we don't have to be afraid of each other. We don't have to talk to each other separately. We can all get in a room together and have these conversations." A concept design for the South End Connector. 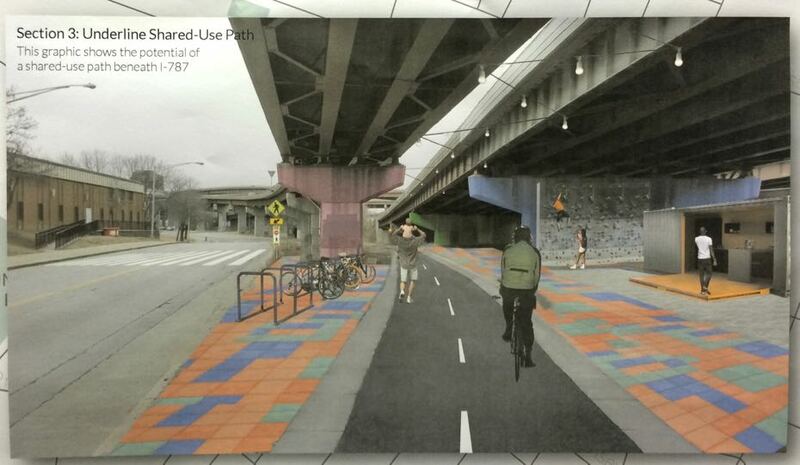 The South End Connector would create a bikeway through Albany's South End neighborhood to connect the Helderberg Hudson Rail Trail with the Mohawk-Hudson Hike-Bike Trail. "We have the design work done for the connector ... There been a lot of people who've said they want that to be fully protected, which makes sense given that you come out on Pearl Street and it's a busy area. So that's going to be the next thing that we construct." The city currently has a request for proposals posted for the final design and engineering work that will allow to send the project out for construction bids. The Clinton Square section of downtown -- roughly the area around the The Palace and toward the river -- is the focus of the city's latest entry in the state's Downtown Revitalization Initiative. (One end of the Albany Skyway will be there at Broadway.) 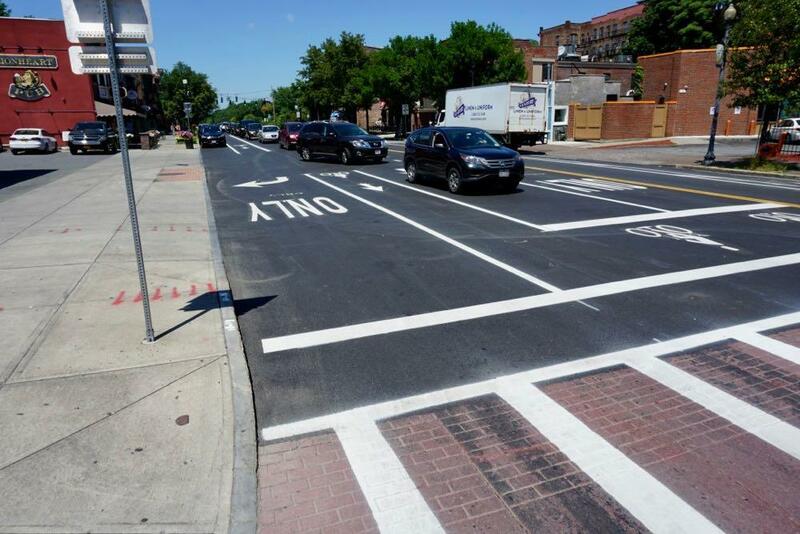 And Sheehan said if the city gets money via that program, it will be looking at upgrades along Clinton Ave.
"We do have bike lanes along Clinton Avenue but we think that there's some opportunities for more traffic calming along Clinton Avenue," Sheehan said. "So then we have, really, at the northern part and southern parts of the city sort of corridors into downtown." Now that Madison in done I've been riding my bike a lot more. I happened to ride what will become the South End Connector yesterday heading to the Rail Trail and boy, that stretch of South Pearl is rough. I took the Rail Trail to Delmar and then Delaware Avenue back into Albany. That stretch of road could use some attention as well. Mayor Sheehan talking about economic development and growing the economy in Albany....let’s jot down how many private major busimesses-employers have been attracted to the city during her time in Office....and I mean private sector companies in biotech hi tech finance robotics pharmaceuticals or any other industry that provides good jobs for the city of Albany......ready here’s the list......................,.
" The new signals _can_be_ programmed to work together." DO I understand it correct that actual programming is not there? BS - Whatever it worth... Census estimates show slight population growth in Albany between 2010 and 2013, and slight decay 2013 till now. 1. estimates are only that, take them with the grain of salt - those were proven to be in error earlier. Thanks to former Common Council Member Leah Golby, along with Virginia Hammer, for pushing the complete streets approach to Madison Avenue. The complete streets now in place is just one of Leah's legacies to our fair city. As someone who walks this corredor almost daily, the call buttons are a mess. You cant get a walk signal unless the button was pressed before the lights change. Arrive at an intersection a second after the cars get green in the direction you are walking? You're out of luck. Either wait an entire light cycle, or cross illegally. I'm sorry, this is far from pedestrian friendly. As a longtime resident of Albany who bikes and walks to get around as much as possible, I think this is wonderful. 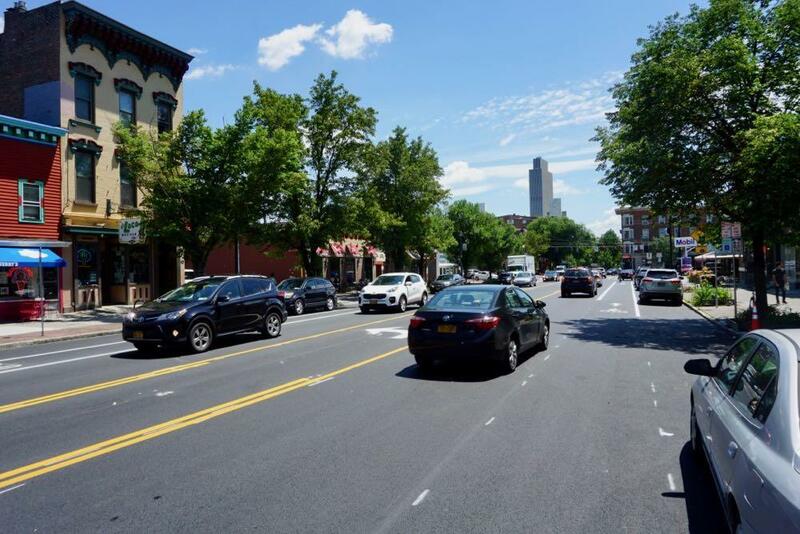 If you only experience navigating Albany from your car, you cannot imagine how scary it is to make your way given the narrow streets, parked cars, and unaware/inconsiderate drivers, as well as areas without sidewalks (shoutout to the upper UAlbany campus neighborhood). I've almost gotten hit a number of times both walking and biking, and I'm always trying to exercise the utmost caution and follow all the rules. It's been lovely on Madison to have this system in place, and I hope everyone can try getting out of their car to enjoy it! Dave - unfortunately that is the way most walk buttons programmed. To discourage their use, I believe. Mike and Dave, what bugs me is when the walk phase gets the minimum 7 seconds, and the light stays green for a minute or more. The walk phase could be a lot longer before it has to start flashing "don't walk." Again, you either have to cross illegally, or wait for the whole cycle. On the subject of moving projects faster, I understand that some things will take longer than we all want, however, critical pieces should be addressed as soon as possible. The intersection at Willet/Washington Park and Madison was not at all pedestrian friendly and I understand it was scheduled to be upgraded in 2014. That never happened, I assume because it was rolled into the overall traffic calming project. It may have cost a little more money to get it done separately, but letting that situation remain for an additional four years really shouldn't have been considered an option. Regarding walk signal times, I agree with the other comments. Most walk signals in this city (and area) seem to give preference to cars. The all-way-red crossings are the worst as pedestrians who want to cross both streets have to wait for an entire cycle between crossings. Ultimately, this encourages crossing with a "don't walk" sign. I took a spin to the Co-Op yesterday evening and took a detour so I could try out the bike lanes on Madison. And I wasn't expecting (but am pleased by) the bike-share markings at the Lark stoplight when eastbound on Madison. Those are important to signal to drivers that a bicyclist belongs in a turning lane, even when that lane is near the center of the road.